1. 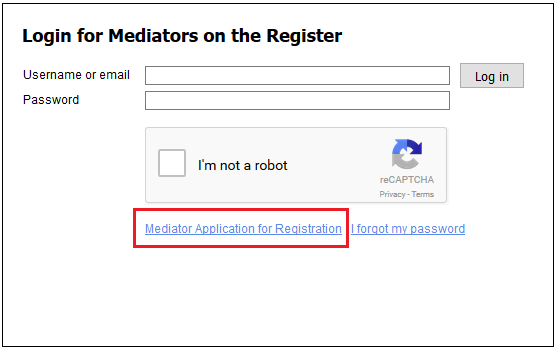 If you are a mediator and wish to be placed on the APIL/FOIL/MASS Register of Mediators the first step for you to take is to review the Criteria on the Criteria page on the website and the form of Declaration on that page. 3. You will then see a new screen as follows, asking for your details and a password. 4. Once your email has been verified you will be able to go back to the website and log in on the Registration/Login page. 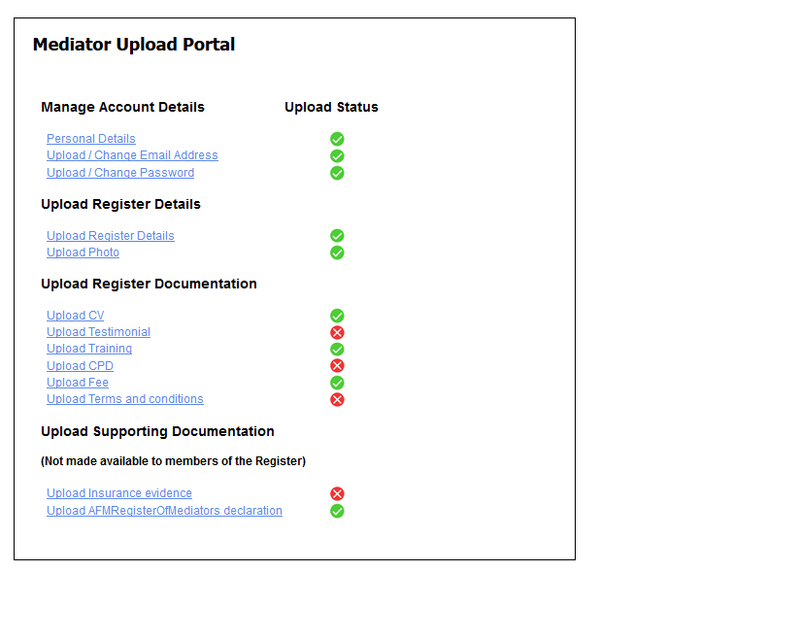 When you have logged in you will have access to the Mediator Upload Portal (screenshot below) and be able to start uploading your documents. 5. To support your application for registration you will need to upload a number of documents. 6. All of these documents will be supplied by you (except the Declaration to the APIL/FOIL/MASS Register of Mediators Users’ Committee which is dealt with below). 7. 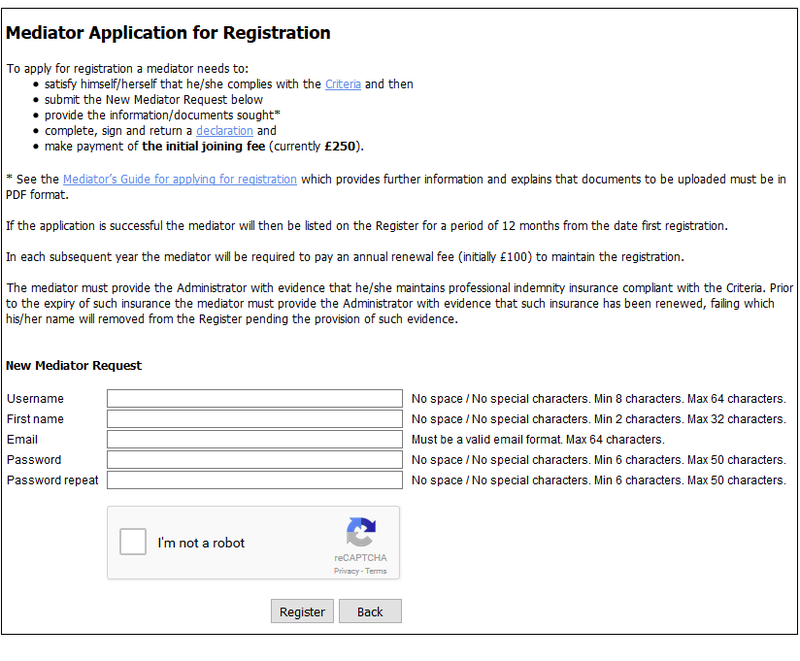 An indication of the required documents is given by the screenshot below of the Mediator Upload Portal. 9. Most word processing and case management systems will convert a document in Word format to PDF format. You can ask your IT support for help or Google search: “how do I convert a word doc to a pdf file?” If absolutely necessary the AFM Administrator may be able to assist, but such assistance may not always be available. Comment on documents required / optional. 11. Photograph (optional). You can only upload photographs in JPG, PNG, GIF & JPEG formats. There is also a limit on the size of document that may be uploaded to the website. The maximum file size that can be uploaded is 2 Megabytes. 12. Video (optional). If you wish to supplement your CV with a video you may provide a link to the website that hosts any video you wish to use. This can be any valid URL, for example a URL for a utube clip. 13. CV. Upload your CV in PDF format. The design and layout of the CV is matter for you. 14. Testimonial (optional). Upload a document with any testimonials that you would like potential clients to see in PDF format. 15. Training. Upload evidence, in a PDF document, of your training certificate as a Mediator to satisfy the Criteria outlined on the website. 16. CPD. Upload evidence, in a PDF document, of your recent CPD training in compliance with the Criteria. 17. Fees (optional). Upload a document, in PDF format, setting out your fee structure if you would like potential clients to see how you charge fees for mediation. 18. Terms and Conditions (optional). Upload a template of your standard Agreement to Mediate, or a similar document outlining your terms and conditions, in PDF format, if you would like potential clients to see this information. Upload a document in PDF format evidencing your professional indemnity cover in respect of your mediation work so as to satisfy the Criteria outlined on the website. Your application will not be processed until insurance evidence that complies with Criteria is supplied. The evidence of insurance must clearly state the date on which the insurance cover expires. If your application has been successful you will then be listed on the Register for the duration of your membership, which will be for a period of 12 months from the date of your first registration, when you were first listed on the Register. 28 days prior to that expiry date the mediator will need to make an application for renewal of the registration and pay an annual renewal fee. If your annual renewal and professional indemnity insurance renewal dates differ, you will be sent a reminder 28 days before expiry of your professional indemnity insurance, requesting you to send a new insurance certificate that is compliant with Criteria. If a renewed certificate is produced before the previous insurance expires, your year’s subscription will continue uninterrupted. If you fail to do so, your entry on the register will be suspended until a valid insurance certificate is produced. Download a Declaration form. You can access this on the website under the Criteria tab. This document is in Word format. Consider the Criteria outlined on the website and then complete and sign the Declaration. Convert the Declaration from Word format to PDF (see paragraphs 3,4 and 5 above). Pay the fee referred to in the Declaration. © Copyright 2017 APIL FOIL MASS. All Rights Reserved.